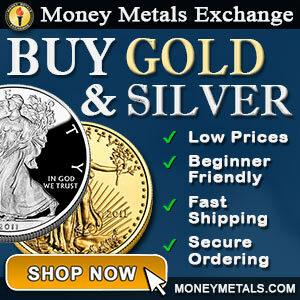 I made a test purchase from Amagi Metals on Sunday night, September 22, 2013 at 10:34pm. 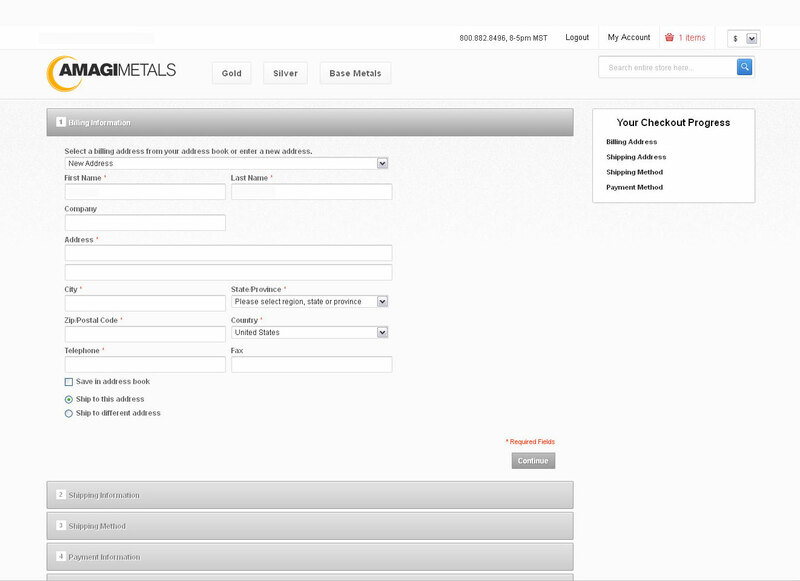 See how Amagi Metals compares to the competition. 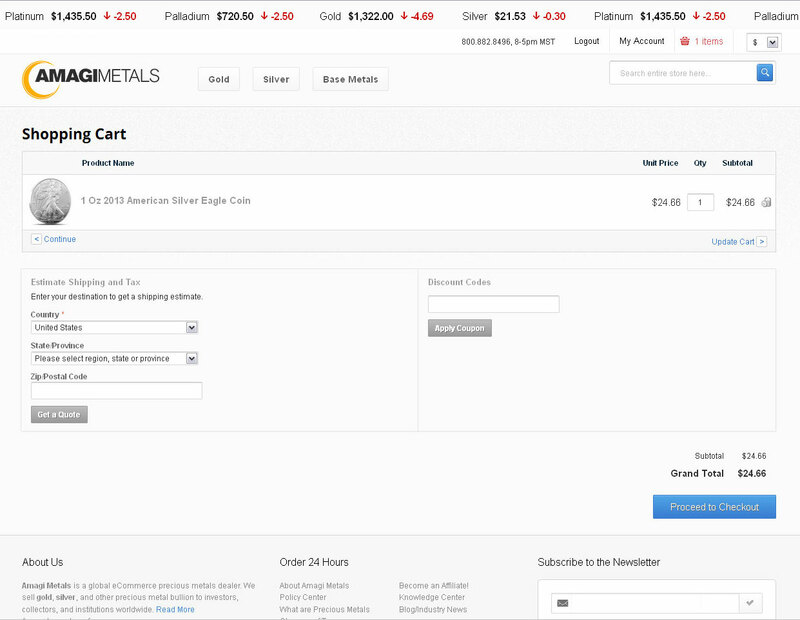 Here is a walk-through of the purchasing experience on the Amagi Metals shopping cart. 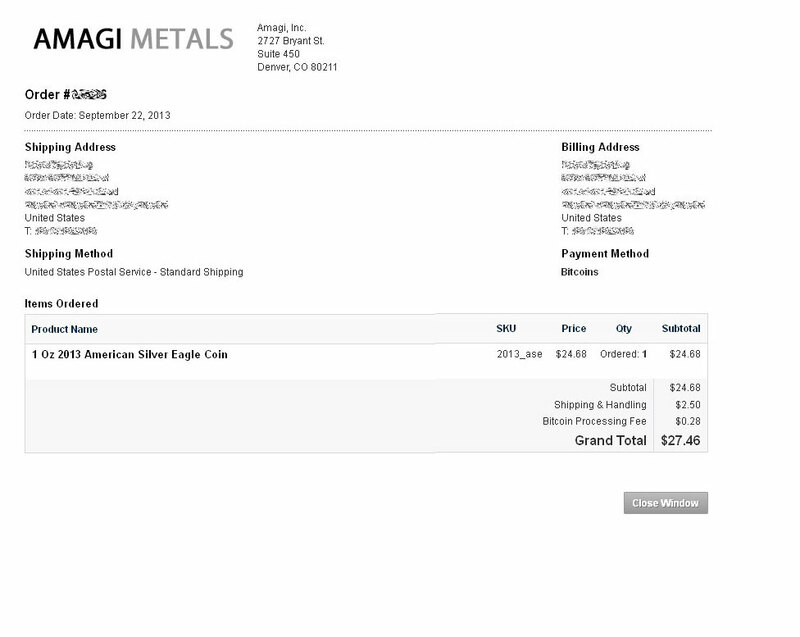 This will be a very detailed review of the buying experience at Amagi Metals, to include any quirks or weirdness I may have encountered during the process. 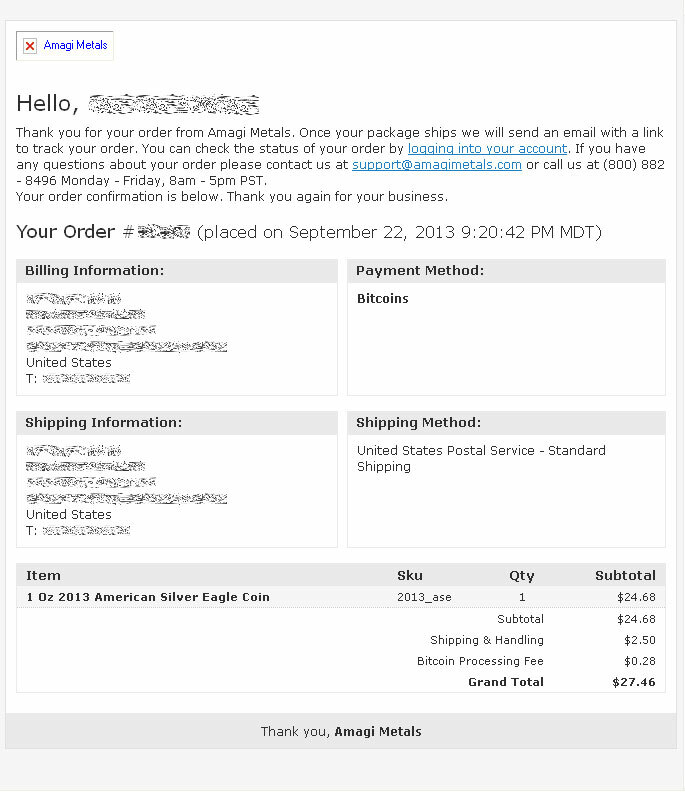 To make this purchase, I started from the Silver Selections tab in the footer area of the BuyGoldWithBitcoin homepage. 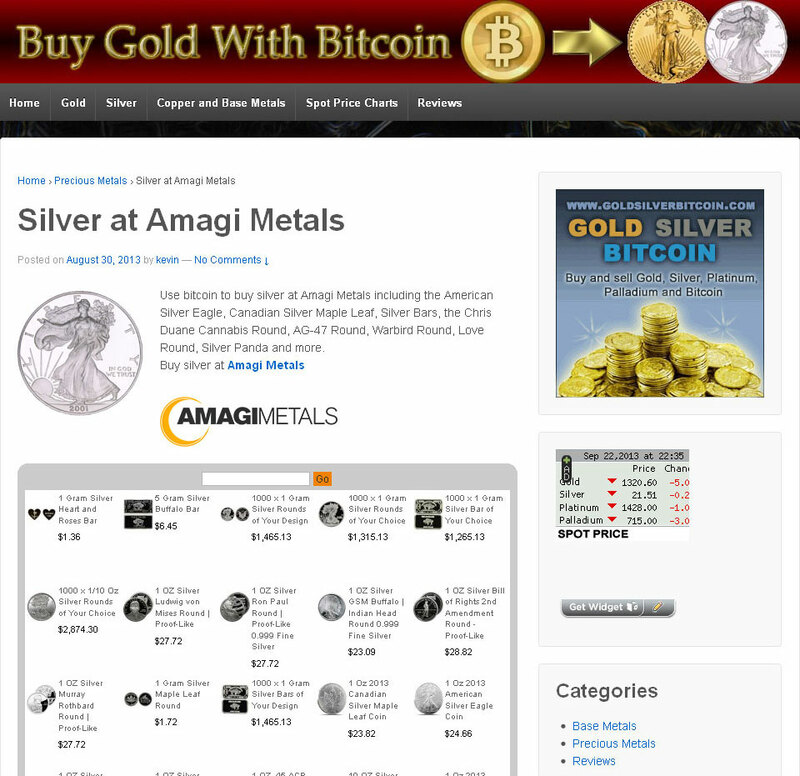 It links to the page which includes all the Amagi Metals selections in silver. At that point, the page looks like this, with everything displayed in bitcoin prices, including the bulk purchase rates. 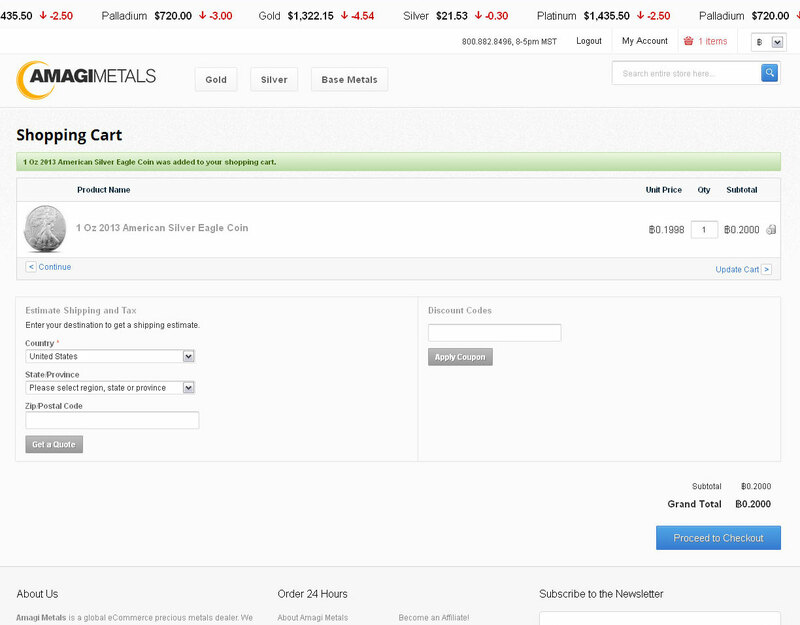 Click the Add To Cart button after setting the quantity. View your purchase in dollars at any time. You can still switch between currencies at this point. Here is how the page looked when displayed in dollars. 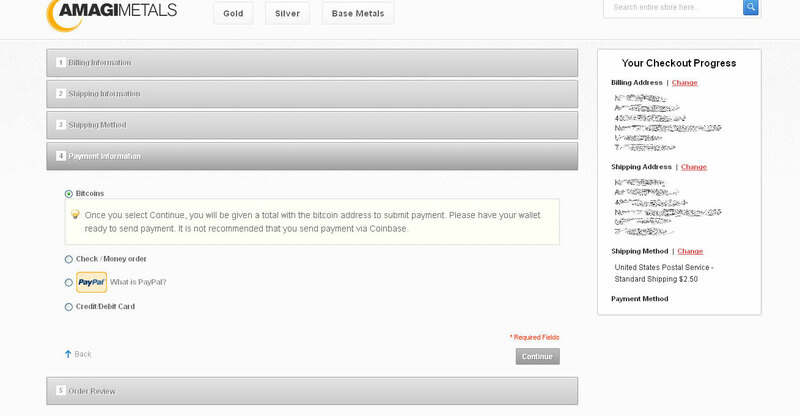 You’ll notice that when displayed in bitcoin, there is an additional fee of 0.0003 BTC (bitcoin) added to cover the Amagi Metals transaction fee. As the bitcoin price at the moment was around $123.00, this comes out in dollars to around a $0.036 transaction fee, or just under 4 cents. 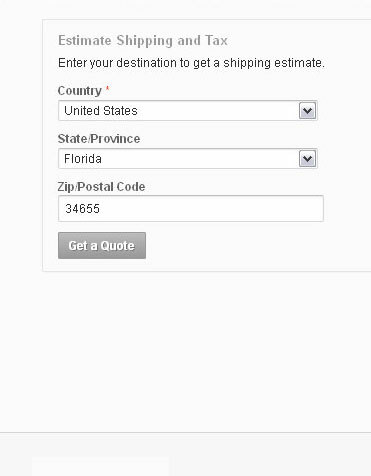 Clicking the Get A Quote button displays the shipping choices. Enter your information in the Estimate Shipping and Tax box. I chose the shipping method with slightly less cost, the USPS (Insured) First Class Mail Parcel. The shipping can be displayed in dollars instead of bitcoin. While switching the currency to dollars, the difference in shipping methods is 40 cents. And then something unusual: Inexplicably, in dollars the less expensive option is not First Class, but Standard. We switched to Standard Shipping at this point. I switched back to Standard Shipping at this point, saving 40 cents. Then I clicked the Update Total button. 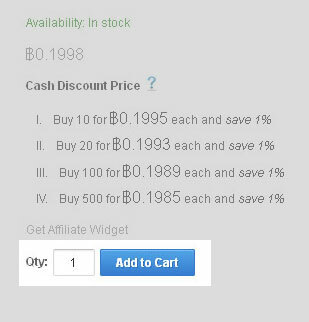 After clicking Update Total, the price including shipping is displayed. The total price with $2.50 Standard Shipping becomes $27.16 delivered. I then clicked the Proceed to Checkout button. On the Billing Information page, with the currency set to bitcoin, I filled out the billing information. I have one of my bitcoin wallets at Blockchain.info. To prepare for payment, I opened my bitcoin wallet ahead of time, which in this case meant opening a new tab or window for blockchain.info, logging in, and clicking on Wallet. 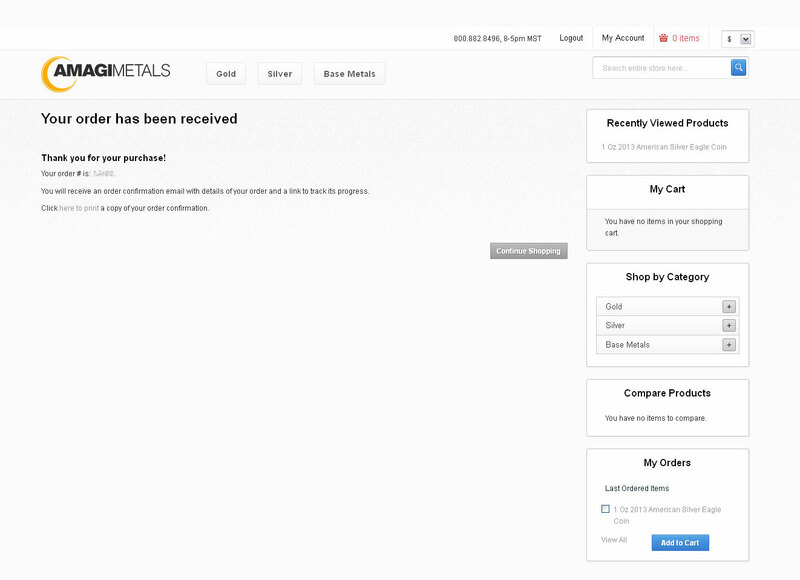 With sufficient funds available, I switched back to the Amagi Metals page, made sure my billing information was filled out, and clicked the Continue button. Shipping Method page with Standard Shipping selected. On the Shipping Method page, the option for Standard Shipping at $2.50 is selected automatically. 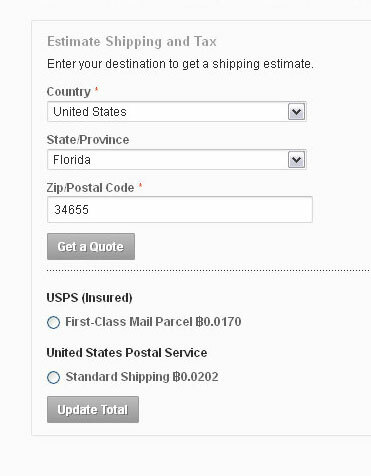 On the right hand column the website displays your billing and shipping addresses, as you previously filled them out. This is a good time to check for errors. Payment Information page with Bitcoin payment selected. With Bitcoin payment selected, I clicked the Continue button. The Order Review page appears next, showing the order with Product Name, Price, Quantity, Shipping, Bitcoin Processing Fee, and Total. Something unusual. The Bitcoin Processing Fee is now $0.28. It was earlier just under 4 cents, but here it is displayed as 28 cents. This brings the total to $27.45 including shipping and processing fees. 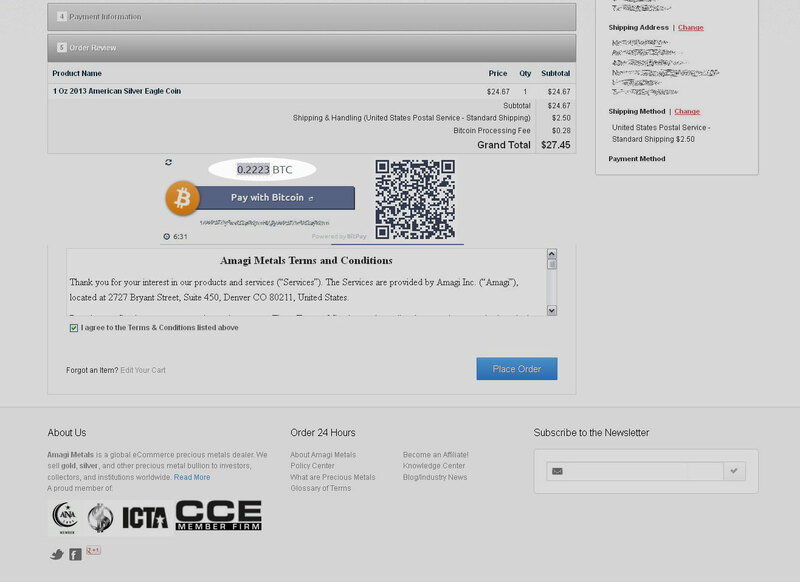 This page shows a “Pay with Bitcoin” graphic, provided by BitPay. 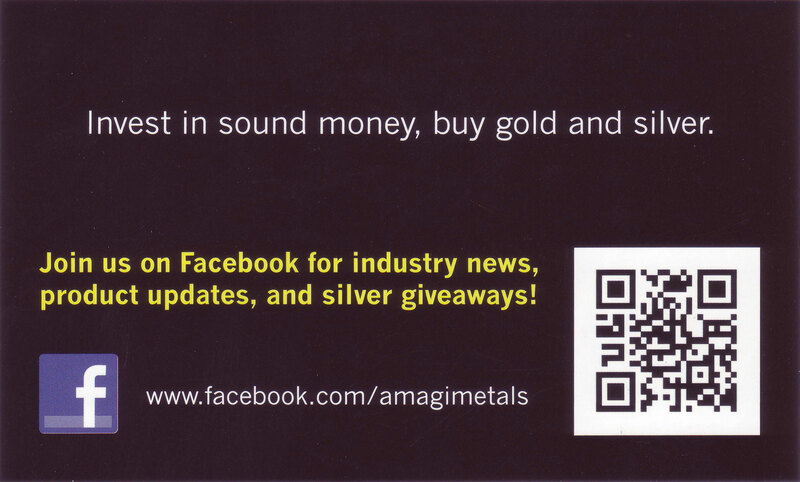 Below that is the Amagi Metals Terms and Conditions. There is a box you must check to agree with the Terms. The amount of 0.2223 BTC is displayed within the graphic. Just under that, in the center of the graphic, is an area to click labeled “Pay with Bitcoin.” I clicked that. Error – “The address wasn’t understood.” My mistake. Oops. It turns out, that’s where you click only after installing a Bitcoin client or application on your computer, tablet or smartphone. I hadn’t installed one, so I got this error. I had preferred at the time to use my Blockchain.info wallet manually, without the convenience of one-click purchasing. I used the back button to get to the previous page without trouble. 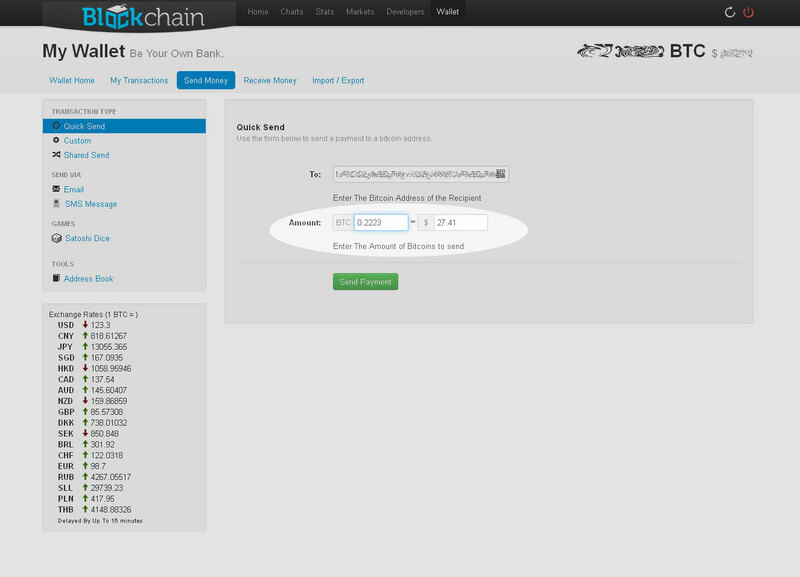 Copy the address which will receive the bitcoin payment. 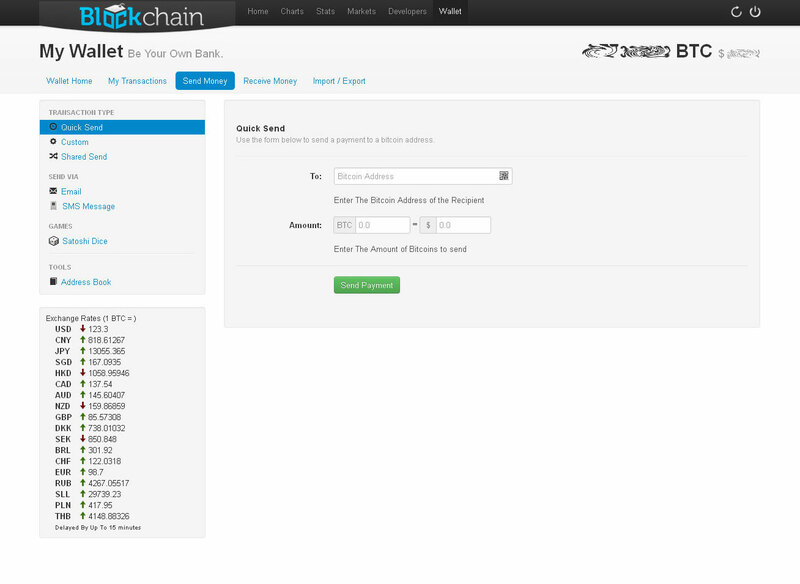 Now back on the page, I clicked on View Address, because I need the bitcoin address that receives the payment. The address appears just below the Pay with Bitcoin button. I selected and copied (Ctrl+C) that address to my clipboard, and went back to my wallet page. I pasted the address into the To: box within my bitcoin wallet. 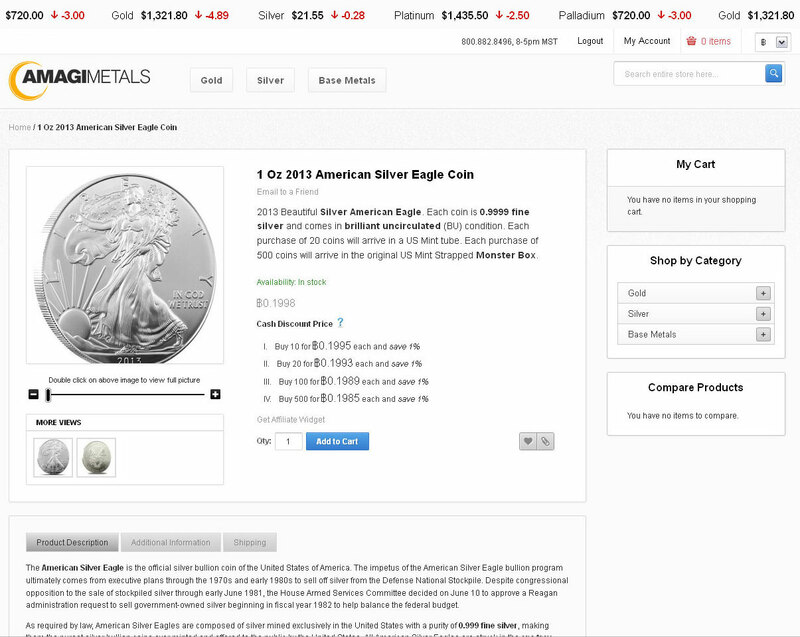 Copy the bitcoin amount from the Amagi Metals page. 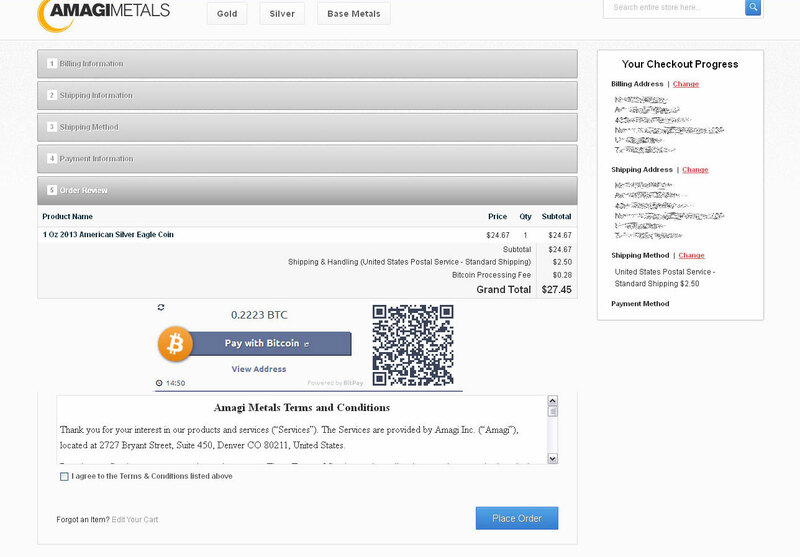 Returning to the Amagi Metals page, I copied the bitcoin amount. Paste the bitcoin amount into the wallet. Paste the bitcoin amount into the left side of the wallet Amount: box. On the right, the equivalent amount in dollars is shown as $24.71. A blue progress bar appears. Double check for mistakes, and click the Send Payment button. There is no way to go back after this. Click the Send Payment button. A blue progress bar will appear immediately for a few seconds, and you’ll hear one beep. 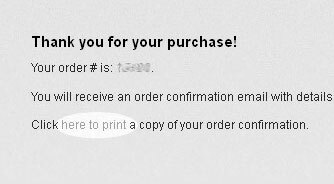 The order confirmation can be printed. 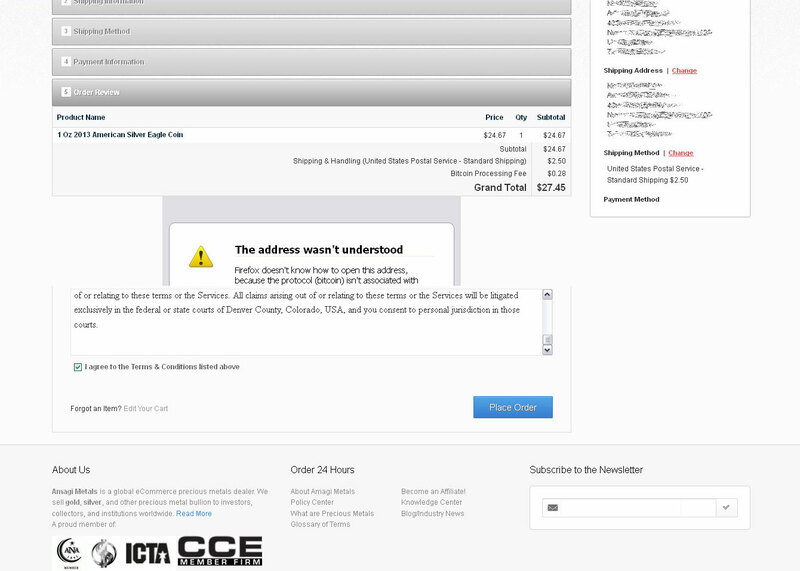 Clicking this link will display an order confirmation that can be printed or saved. The confirmation email arrived immediately. The order status shows “Payment Review”. 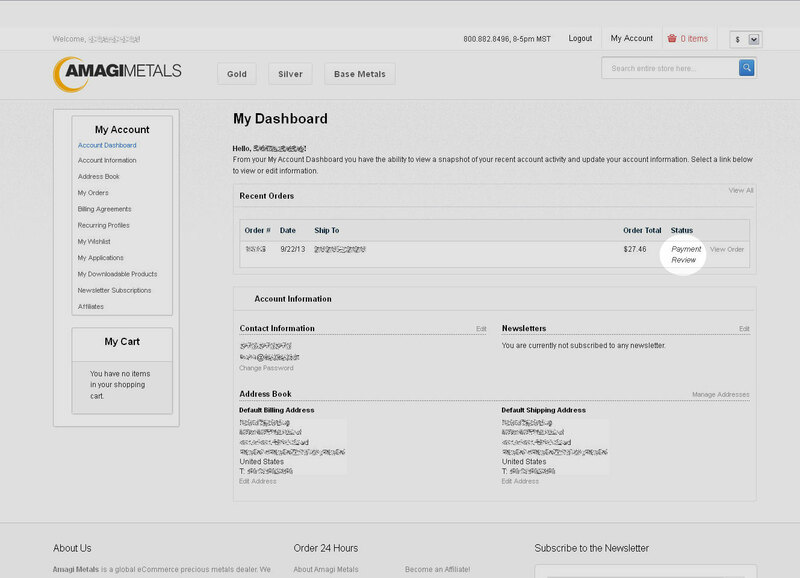 Going to My Dashboard at Amagi Metals, the status column shows “payment review”. The status shows “Received Payment”. Email with tracking number for USPS First Class arrived the same day. The USPS tracking number arrived by email at 6:05pm the same day, just 4 hours after the payment was cleared. It included a link for tracking the order through USPS First Class. 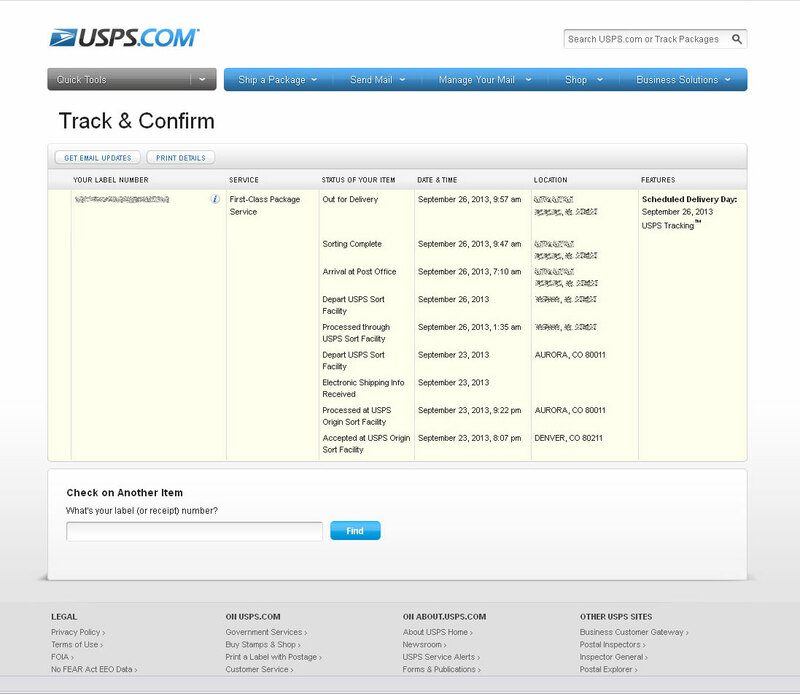 The USPS Tracking page confirms the delivery on Thursday, on the 4th business day after ordering. The USPS Tracking page provided updates until the order was delivered on Thursday, on the 3rd business day after the order was received. 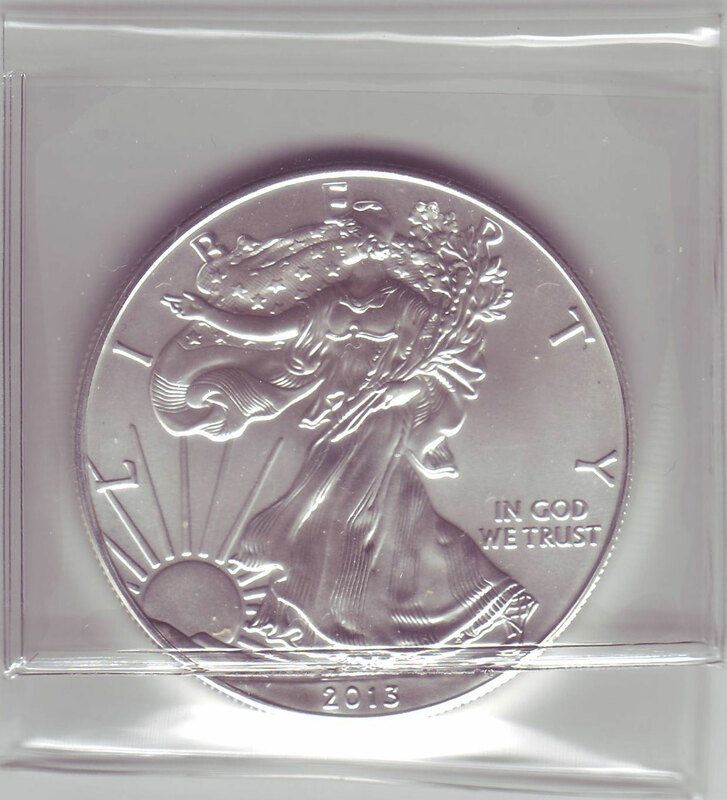 Here is the coin as it arrived shipped in a clear plastic sleeve within the postal envelope. 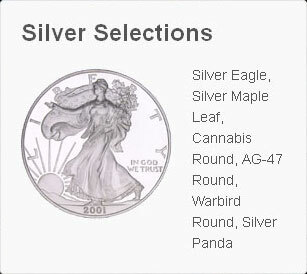 A one-ounce American Silver Eagle as shipped by Amagi Metals. Here is a better scan of the actual coin. You can enlarge it to see the closeup detail on the coin, showing just a few light bag marks on the reverse. It is a nice example of the ASE, one of the world’s most beautiful coins, the 2013 American Silver Eagle. 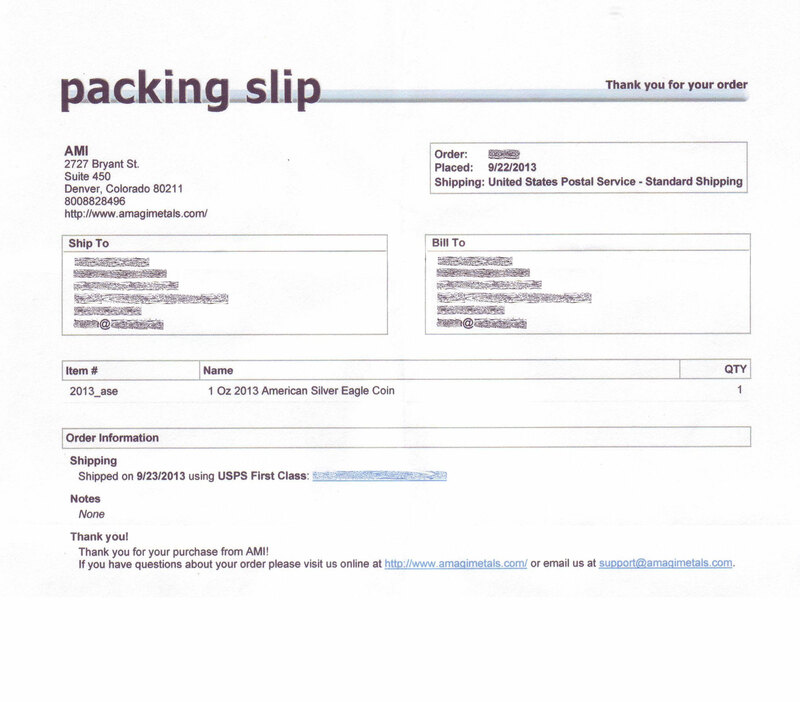 Packing slip indicated not amount paid, only the contents shipped. The packing slip was professionally done. It did not indicate the cost of the sale, but only the contents shipped without a declaration of amount paid. 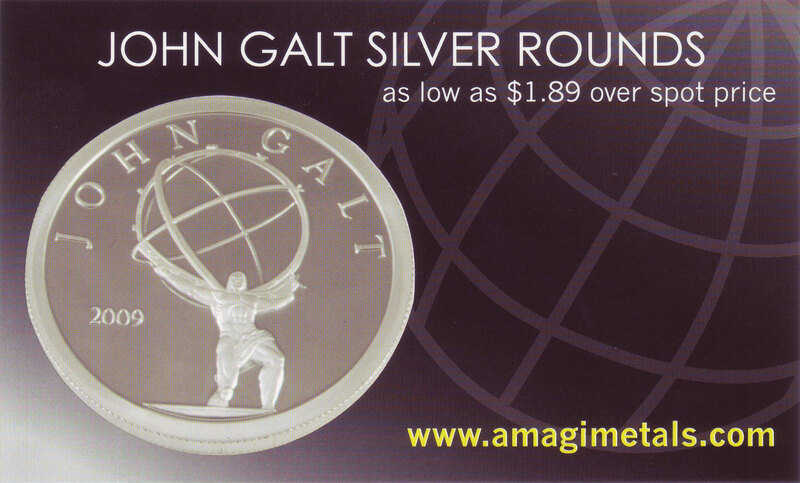 A printed advertisement for a John Galt Silver Rounds special “as low as $1.89 over spot price” was attached to the packing slip with a rubber band. 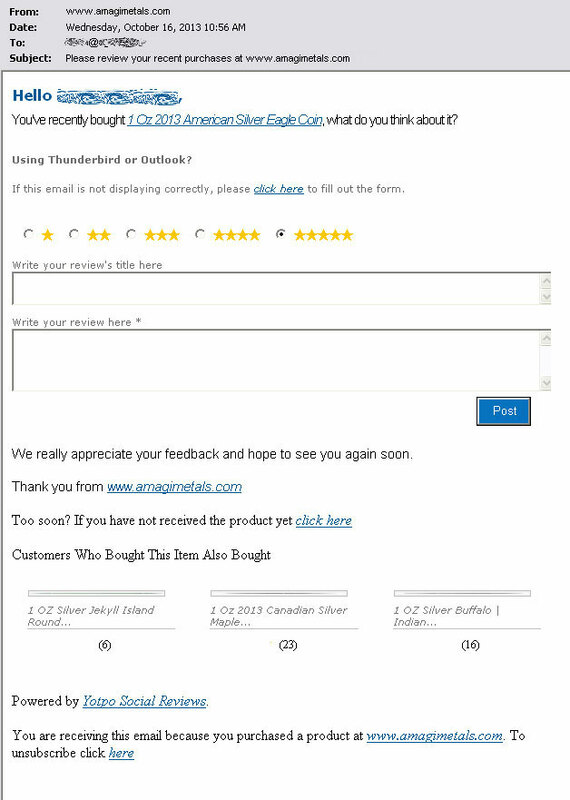 The recent purchase review form arrives 3 weeks after purchase. In this way, the customer is encouraged to report their level of satisfaction with recent orders, which is a reassuring sign of good customer followup at Amagi Metals.